It's almost time to say Happy New Year... but instead i want to introduce my new project: RPI Easy. If there is anyone who has a Raspberry PI and wants to use it's GPIO with sensors in a similar way, that ESPEasy offers (special thanks to the ESPEasy Dev Team!) than this project he is looking for. I like ESPEasy, I have several ESP8266 at my home, but also have some Raspberry PI Zero W, which consumes not so much, despite their computing capacity. So it looked like a logical step to me, to rewrite my old python sensor handlers, and merge somehow with the ESPEasy user interface... it was harder than i thought. Earlier i used RPI's with several different and personalized python codes, but today (after six month of development) i decided that RPIEasy reached a milestone, and i publish it. The project needs some testers and feedbacks. I do not say that it is stable, instead i say the truth: it is a beta development version, with a lot of work to do. Happy to see the progress! Do you want to add this to the official GitHub repository? noob tinkerer, my projects are @ http://iotplay.blogspot.com . Using RPi, Node-Red, ESP8266 to prove Industry 4.0 concepts. Thank you. I think it is in good place now. In case of anybody has fixes, it can be forked. Altough a forum section would be very nice. On a VM for now, going on an OPi0 tomorrow. Is it possible to add PME extender plugin (_P011_PME.ino ) to get efficient use of pro mini to get analog input,extra GPIOs and use of interrupts from pro mini ? I see you already implemented I2C interface. This is what I was looking for way back before I found ESPEasy. Was trying to find something like this for the PI. Perfect for folks like me that can bash hardware together but don't know squat about programming. Will definitely be testing this!! I think it is possible, but not in the near future, as i do not have a PME device, and blind programming is not my strength.. i developing plugins with trial&error approach, for example: as i wrote this message i just found a bug in my basic Switch plugin, when i am testing. I forgot to mention, that ESPEasy P2P controller need to be enabled, to join the network, but as i see, it is obvious. And as you see, i missed sorting in the unit list, adding it to the issues. Also the "Type" only shows up on RPIEasy node listing but not from within the standard ESPEasy node list. It needs to be fixed at the ESPEasy code, not in the RPIEasy. Only one PR away You need to apply. Thanks i opened an issue. Is HTTPS/ TLS a feature you would consider given the ESP82XX limitations do not exist in this approach ? Paho MQTT library can do SSL, only a matter of time and energy. Python Urllib also can do TLS/SSL, costs only a few line of code, some cert, and a lot of headache.. added an issue to github. remote: Enumerating objects: 100, done. remote: Counting objects: 100% (100/100), done. remote: Compressing objects: 100% (71/71), done. Receiving objects: 100% (100/100), 134.40 KiB | 0 bytes/s, done. alsa-utils is already the newest version (1.1.3-1). wireless-tools is already the newest version (30~pre9-12). wpasupplicant is already the newest version (2:2.4-1+deb9u2). zip is already the newest version (3.0-11). zip set to manually installed. python3-pip is already the newest version (9.0.1-2+rpt2). Need to get 547 kB of archives. After this operation, 922 kB of additional disk space will be used. Selecting previously unselected package screen. Thanks for that, found the file using the gui file manager. I am just amaze that the pi can multi task so many servers at the same time, as the pi now has vnc desktop at 5900, ssh, node red at 1880, and now rpieasy at 8080 and all working, is there a limit to number of servers the pi can handle. Also a quick question can one change the port for the rpieasy? If you run it as root, it will try to use port 80 (as only root can use ports <1024), if it fails (not root or used by other program), than try to use 8080, if none of the above available tries to use 8008. I do not really want to provide port selection because i have a network scanner program, and if i do not know what ports to search, it will be hard (slow) to find them on the network. Hint: A lot of settings, for example GPIO pin working mode (input, output, hardware pwm), dependency install, wifi scan only can be reached as root. Last edited by enesbcs on 01 Jan 2019, 11:14, edited 2 times in total. Yep, i left out "cd" command after "git clone" in the readme. Thanks, fixed! How can I make ESP auto restart if I reboot PI? Does it work with diet pi? Nice development! I've noticed you mentioning Python in your first post. Is this a pure Python based project? Meaning that it could run on other platforms that support Python. Like the ESP32? And did you know that another Python project (uPyEasy) already exist? Maybe you could team up with the other developer(s) to share the effort into one project? Although it looks like the uPyEasy project has not seen any changes recently. Don't know the status. Anyone? Thanks, but ESP32 is unable to run Python3. micropython is similar to python3 but not the same. Besides, i am using a lot of Linux OS functions, which i doubt that exists in micropython. If you compile an application to ESP it will be a complete OS, RPIEasy is only an application and built upon the Linux OS. So it IS a pure Python3 based project which may run on platforms that runs Linux... mainly targeted to Raspberry's, but also running on desktop PC's with Debian/Ubuntu. In the (far) future it may be extended to Orange PI or Nano PI, i am not sure, they GPIO handling may differ a lot. I am aware of uPyEasy and originally i thought that i could use it on my Raspberry's. As i wrote previously, the differences are so huge, that instead i write an own solution, based on the ESPEasy C code and HTML stubs. It is unlikely that uPyEasy and RPIEasy can share any codebase, as i don't see any common point in them. All my respect is the uPyEasy developers, but in my opinion ESP-like devices simply do not have enough resources to run a python program efficiently, instead ESPEasy32 seems a better way to use ESP32, sorry. But again, i am not an expert, it is my private opinion. Hello, I connect 18b20 with 4.7k resistor to the GPIO22 but cannot see the 18b20's Device Address box and temperature values. What I am missing? 1. Did you setup a 1WIRE pin? 2. Did you reboot after that? I check cables few times and see nothing wrong. There is nothing after typing "lsmod | grep w1"
OK, this is because w1-gpio driver is not loaded on your system, so Linux kernel is unable to detect DS18b20 sensors. DietPI uses the same kernel as Raspbian, which i've got for testing, so w1-gpio has to be included. 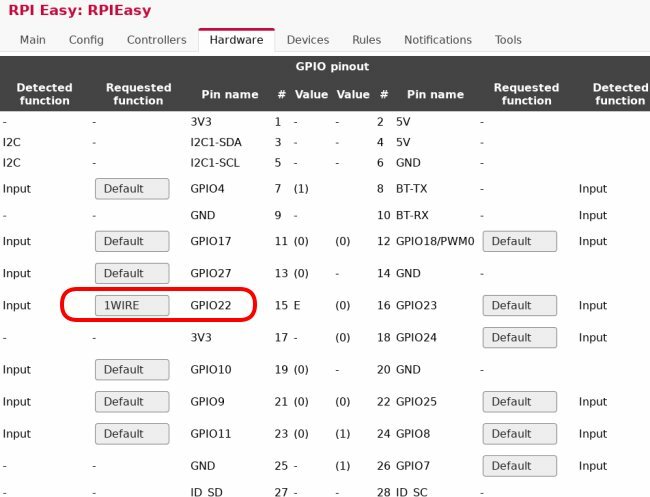 Please post "cat /boot/config.txt" and PrtScr from RPIEasy Hardware page and PInout&Ports page with GPIO22. Sorry about it but still not working, should I use raspian instead of dietpi. I choose dietpi for not using lots of system source. Dietpi kernel is the same as Rasbpian so i do not think that it makes a difference. Could you test this DS18b20 with az ESP8266/ESPEasy for example? Is it working fine? Test the specific ones that you are having trouble with RPIEasy just to verify they are functional. Thanks for all suggestion but solution comes with the adding dtoverlay=w1-gpio code to the /boot/config.txt .But I cannot edit config.txt by typing sudo nano /boot/config.txt to the console. Each time it did not save config.txt, then I put SD card in a windows OS then add dtoverlay=w1-gpio bottom of config.txt. Maybe that help anybody who will use dietpi. Hello again, I wonder how many 18b20 can be work without problem with pi zero that runs esp firmware without issue? I have got two DS18b20 sensors so i am unable to test it for you.
. Am I right is that yours? Yes this is my creation and currently is my only thermostat at home. It needs an ESPEasy firmware with a special plugin to use, can be downloaded here:. Maybe I need some directions from your side as I see your page is hungarian Should I hesitate to contact with you? Time is the most valuable thing in the world I don't have. Maybe it can be used at the new homepage, that grovkillen mentioned before. Today's commit on github contains preliminary support for SSL at the Controllers. Needs some testing. Cool project!! I still must have an Orange PI zero somewhere in the collection of abandoned projects. Ordered because it was only 14 euro. I thought it was the same as Raspberry pi but it was not. But could this run RPIEasy? I remember that i ran Armbian firmware on it. I had an Orange Pi earlier, but i sold it away instantly, after shocked by it's poor software support and a lot of outdated libraries... even the gpio numbering scheme was a mess! (at least with the cheap Orange PI Zero W that i had, which also has a crappy integrated XR WiFi with a chaotic and erratic driver, and effectively heating my room as it's CPU going to 70C after startup) You are right about that RaspberryPI is not the same as an OrangePi. Maybe in the far future it will be supported by RPIEasy. Currently i do not have any Orange PI for testing, and not planning to buy one, GPIO and I2C based stuffs will not work for it, generic, usb and audio plugins may work as they work on my Ubuntu PC also. Raspberry Zero W is only 10GBP, and works out of the box, works with an up-to-date Raspbian OS, if i set GPIO22 to high from software, than the correspondent pin will go to high and it is easy to find it, based on it's detailed and updated documentation. I have five RPI ZeroW home, running 24/7 for a year now, an average of 1W consumption, CPU is 39-42C without a cooling fan. Neither of this true for the Orange PI.